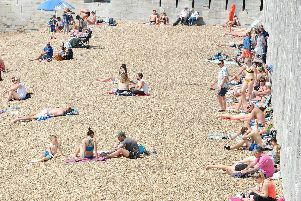 Portsmouth has been in the grips of a heatwave all week but will it continue over the weekend? The simple answer is yes. The Met Office is forecasting that the warm weather is going to be sticking around over the coming days. Temperatures are expecting to soar to 27C today, making it the hottest day of the week so far, as the clear skies and sunshine continue yet again. Currently highs of 27C are also being forecast for Friday by the Met Office, so no respite from the warm weather. The forecast for the weekend makes similar reading with highs of 25C predicted for Saturday and 26 degrees on Sunday with wall to wall sunshine forecast for both days. And the Met Office is predicting that the heatwave will continue into next week with highs of 25C forecast for Monday and 24 degrees predicted for Tuesday and Wednesday. The glorious weather is expected to be around for the next few weeks and is caused by high pressure settling over the UK and warm winds arriving from the continent.